Samsung is upgrading its Galaxy C9 Pro smartphone with a new 128GB internal storage option. The new variant has passed through Chinese telecommunication authority TENAA carrying the model number SM-C9008. The 128GB variant bears the same specifications as the original Galaxy C9 Pro with model number SM-C9000 except for the memory configuration. It will have the same 6-inch Super AMOLED Full HD display, Qualcomm Snapdragon 653 octa-core chipset, 16MP front and rear cameras, and 4000mAh battery. The original version has 6GB of RAM and 64GB of internal storage. With the new upgrade, however, the 6GB RAM of the Galaxy C9 Pro will be paired with 128GB of internal storage that can even be expanded up to 256GB, making the device even more powerful. It appears that there won't be a gold pink color this time, though, as the TENAA listing shows that the new Samsung Galaxy C9 Pro 128GB will be available in gold and black colors only. But, same with the previous version, it will still run on Android 6.0 Marshmallow. 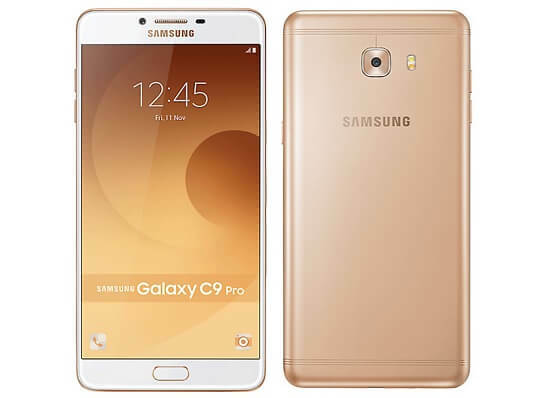 Pricing and availability of this new Galaxy C9 Pro variant are yet to be announced.